There’s an app for everything and this one is specically for the guys out there! The Andriod market introduces the BroApp to the Google Play Store for $1.99 and soon it will be able to iPhone, iPod, and iPad users. The app was developed with the aim of allowing boyfriends to send pre-programmed texts to their girlfriends. Yes, you read it correctly. Now boyfriends worldwide have the ability to program text messages that can be sent to their girlfriend without having to actually text her. How sentimental is that? The idea for the app came from two Australian men in wanting to make their girlfriends feel adored. Why couldn’t they send a text like everyone else, in real time with real emotion? I’m guessing if you’re a guy that has a busy schedule and you don’t want to miss a beat with your girlfriend, download this app. Some women are actually protesting against the app being dwnloadable to their boyfriends’ phones. I don’t blame them. I can understand you get busy, but step away from your work when you can and shoot me a text or call me. I know what it’s like to have a busy schedule, trust me. Women also feel that the app will be misused. Their boyfriend could be up mischief and still have the ability to make it seem like they’re at home. The intention behind the app seems great, but it’s existence stirs up little controversy. “BroApp is smart, taking all possible steps to safeguard the BroApp secret. BroApp’s unique detectors integrate advanced Android technologies that ensure your girlfriend never becomes suspicious of your relationship wingman. 1. Girlfriend Wifi Detector: BroApp won’t send messages when you are at your girlfriend’s place. 2. Girlfriend Intrusion Detector: BroApp will prevent inquisitive girlfriends from uncovering the BroApp secret. 3. 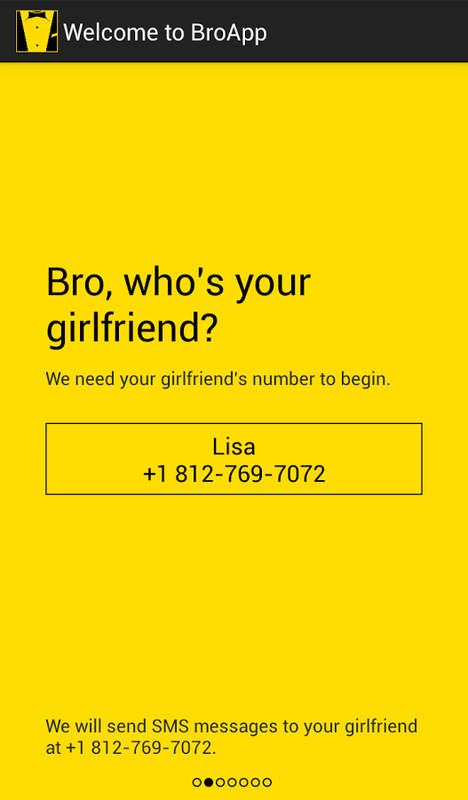 Recent Contact Detector: BroApp won’t send messages if you have recently communicated with your girlfriend. What do you think about the BroApp? Download it today from the Google Play Store.